After being sick for a week in Penang, we needed some time to chill. We wanted to stop hiding under the humming motors of air conditioning. We wanted to go someplace cool. 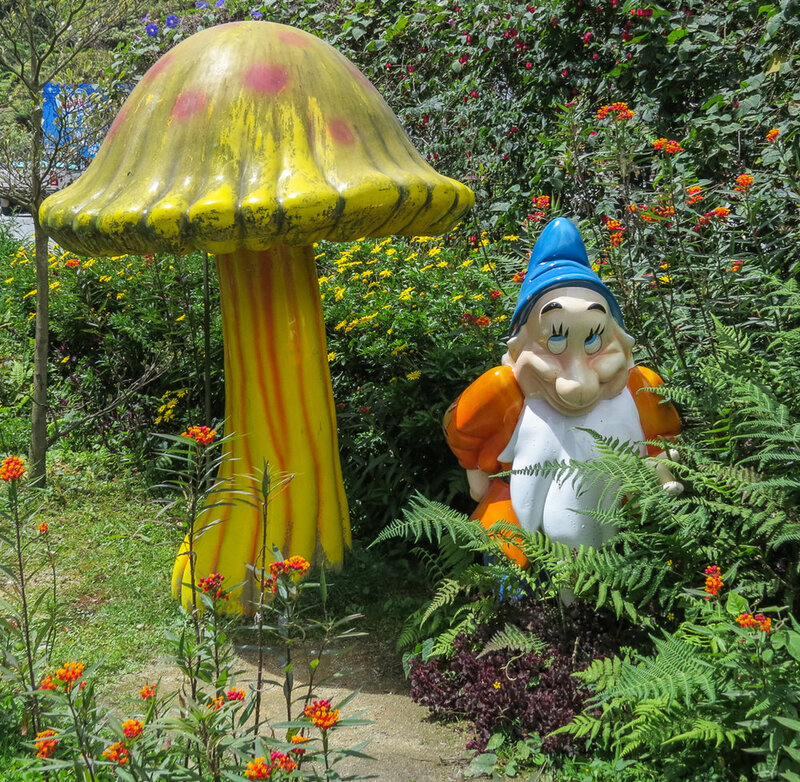 When I think about Malaysia, I don’t think of “Bashful,” or any of the other six dwarfs. Looking through the tour books, blogs, and Trip Advisor, we found mixed reviews and recommendations for visiting Cameron Highlands, Malaysia. Our homework wasn't promising us much, but we had the time and hey, we were in Malaysia. What's not to like? It is listed as a top thing to do in Malaysia, and it wasn’t 90 degrees with 90 percent humidity. So we booked a room, and got on a bus. The hills above the coastal urban areas are known for strawberry farms, tea plantations, agriculture, and a mild, comfortable climate. We committed to our Airbnb with only a little information about the area. The room had a small kitchen, a nice sitting area and a balcony overlooking a berry farm. It was close to shops and restaurants, and it would be good for our last two days in Malaysia. When we got there, we found the area very developed. The Butterfly Farm, the Cactus garden, the Bee Farm, the Strawberry Farm, tea plantation tours, the "Time Machine Museum" and other human-constructed attractions have overshadowed the natural beauty of the high jungle. I'm really not interested in spending time and money at those attractions. From our room, we had a view overlooking the famous Cameron Highlands’ strawberry farms. Rows of new corn in the Cameron Highlands. We were disappointed to find no trails and very few ways to access natural areas. The Highlands is clearly catering to the weekend tourist who is willing to pay a few dollars to be entertained for a few hours. I also expect that numerous large bus tours stop at the shops and tourist attractions. Not to be deterred from seeing something 'real,' we hired a guide from Eco Tours Cameron for the day to take us out to see the Highlands' jungle. Keith was very excited about the opportunity to see more birds, so he hired a guide for a half day birding tour. The guide picked us up before dawn and took us to a city park, not far from the local High School. There we were able to hike a trail through a section of the rare remaining jungle. We walked along a path that followed a small stream, past campsites, and picnic areas. It was quiet, and I like taking hikes in new places. We found no mention of this place in our pre-trip homework. While on the trail, our guide would call out "there's a 'so-and-so' bird" and point at a tree or shrub. Keith would find it in his binoculars and repeat the bird's name with much satisfaction. Next Keith would call out "there's a 'so-and-so' bird" and point at a tree or shrub. They were having a great time taking turns finding little peeps hidden in the jungle. I had fun just being there, outside, on a trail, surrounded by exotic native vegetation, and not sweating. That's what I wanted to do. We hiked along a small jungle stream and listened to the noises of the natural landscape. Aside from the day with the guide, we didn't find much appealing about Cameron Highlands. We had a tough time finding food, and what we finally selected to eat was not good. In fact, our two meals were the worst of our entire trip to Asia. I'm sorry that they chose development and tourist attractions rather than taking advantage of the area's natural beauty and wild spaces. I wouldn't call it ecotourism or sustainable tourism. I'm not sure what I would call it; maybe "Tourist Tourism"? I could call it "something for somebody else, not me." How many people travel to buy keychains and cactus plants? Not this wanderer. I already have a keychain. Anyone need a strawberry key chain? I’m glad I saw the Cameron Highlands, but it isn’t on my list of favorites. I hope their target tourist has a great time. 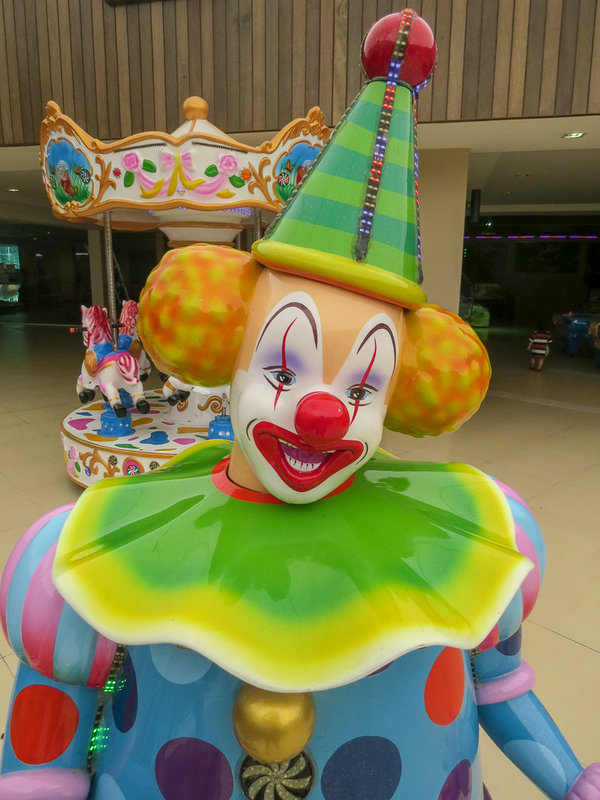 A “Steven King IT” clown in the hotel lobby.